If you’re one of the millions of people who will be tuning in for every drive, chip and putt of this year’s biggest golf tournament, you’re in luck. Now you have different options for using the tech you know and love to keep up with all the action, whether at home or on-the-go. We’re sharing all the information you need to know about streaming live sports from any of your connected devices. Streaming is a technology that sends video over the Internet to devices like computers, smart TVs, and phones. Many sports fans turn to streaming when they’re at home, on-the-go or even at work (we won’t tell your boss). It gives people the flexibility to watch whenever and wherever, and its capabilities continue to grow. However, with that increase in popularity comes the potential of connectivity issues. According to a recent Asurion survey, 80% of people get some level of frustration when dealing with a slow or dropped Wi-Fi connection. No one wants to be left staring at a frozen screen wondering if Rickie Fowler sunk that putt on the 18th green at Augusta National to (finally) win the Masters. We understand, and we’ve got you covered. Our experts are on top of tech and are here to share the latest streaming tips and tricks. Depending on the sporting event, some major TV networks offer free access through their apps or websites. 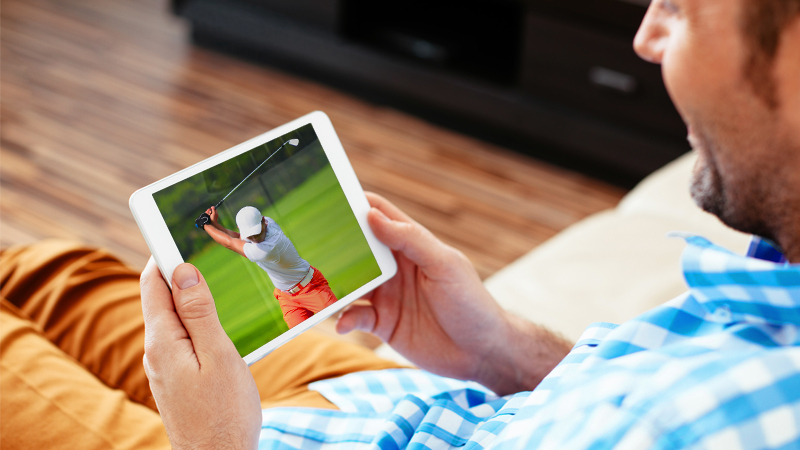 For golf fans, you can watch Masters Tournament live coverage on the event’s official website or their official app (for iOS and Android). Follow along with featured groups, watch the live TV broadcast, check out how the pairings do at Amen Corner (the 11th, 12th, and 13th holes at Augusta National), and, of course, the Green Jacket Ceremony. If you have a streaming device like Apple TV, Roku, or a number of other connected devices — it’s as simple as downloading the app, and then you’ll be on your way to streaming all the action. Be sure that you download and test it ahead of tee time, so you can ensure it works smoothly. Live TV streaming services like FuboTV, Sling TV, Hulu Live TV or YouTube TV are as close to a cable package as you can get without the contract. They offer most, if not all, of your favorite live TV channels streamed over the internet. Each one varies in their channel lineup, so pick the one that works best for you. Not sure? No problem! Many of them offer a free trial period, so try one out for the Masters and decide if you want to keep the service after (don’t forget to cancel before you’re charged if you decide it’s not for you!). One of the best ways to prevent buffering is to move your router to the same level of the home as your TV. Routers are good at sending signals horizontally, not vertically. So, if your router isn’t on the same floor as your TV, you may have more buffering issues. Better yet, consider hard-wiring your router with an ethernet cable. If buffering issues do occur, it’s best to wait for it to finish – it’ll most likely pick up where it froze. If you close or refresh the app, it will reload and jump forward to live. Why is there a delay while I’m streaming? Streaming games has its advantages, but there’s also one disadvantage worth pointing out: real-time delays (aka latency differential if you’re fancy). More than 63% of people say they get frustrated when the video they’re watching lags behind. Depending on how you’re choosing to stream live events, the delay can run anywhere from 13 to 39 seconds. Not a huge chunk of time, but in sports, a lot of things can happen in a matter of seconds. Best way to combat the delay is to turn notifications off on your phone while watching and stay off of social media. Nothing ruins the drama of a final putt like the person who yells it out… before it happens on the screen. Why is my internet running slowly while I’m streaming the game? Leave the competition for the golf course. If others in your home are planning to binge-watch or play online games instead of joining in on the Final Round fun, you may end up competing for bandwidth. Having multiple people on their devices at the same time can not only slow your speed, but also reduce your streaming quality. Ask them to download their movie or show in advance. That way the Wi-Fi signal will be all yours. If you’re streaming games from your phone, that can be a drain on your data and your battery. For more on battery saving tips for streaming, read here. We think tech help should fit your life, not the other way around. If you need help, we’re here. Because at the end of the day, it’s about getting back to what matters most to you – and we completely understand if that’s laying on the couch, pretending you’re a professional golfer while watching the Masters.